This website is an addendum to our KOW SWAMP website. 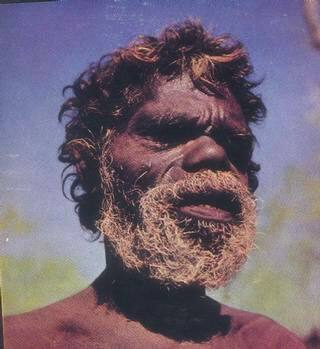 But beyond that, it is a photo essay dedicated to the most mysterious people in the world ...the Australian aborigines. The word aborigine, technically means an original native of the land. The American "Indian", for example would be the aborigine of the American continent. But "aborigine" is used very rarely in this technical sense and usually refers to just the Australians. Perhaps this is their legacy. They believe they were the first people of Earth ...and perhaps, in their way, they are right. At any rate they reflect the past in a way that is fascinating and admirable. Hence this photo journal containing some of the final photographic records of them in their purest form. A kind of temporary immortality as it were. In this photograph series, we are emphasizing individuals with the unique characteristics that survive from recent anscestors whom we refer to as the "Kow Swamp type". Robust and somewhat archaic, these people have reminded many of earlier types of extinct humans that inhabited South East Asia. 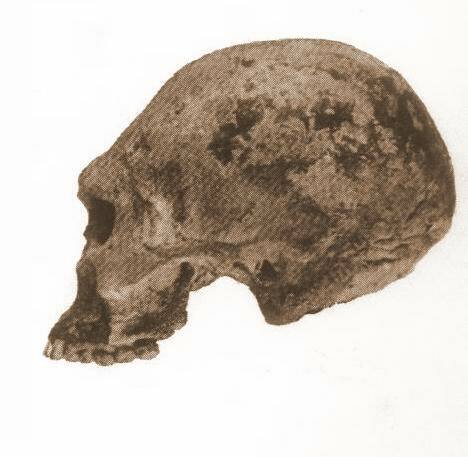 The "Cohuna" cranium shown on the right is the first Kow Swamp discovery and is about 15,000 years old. What puzzles paleoanthropologists is that the special archaic "Kow Swamp" traits are from such recent fossils. Scientists wonder how these morphologies might effect various theories of prehistory. There are several pages in this picture album. Whenever you want to view a different page, simply drag your curser to the "aborigine" index at the top and click on the page you wish to visit. 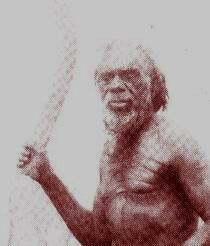 And now ...enjoy AUSTRALIA'S UNIQUE SURVIVORS - THE ABORIGINES! page and click on "Page 2"
Comments or suggestions are encouraged at: Canovan@twmi.rr.com. More photos on next page.....CLICK on the tiny picture above to turn to Page 2 ...OR Use your "magic" curser to choose a page of YOUR CHOICE in the ABORIGINE INDEX at top.